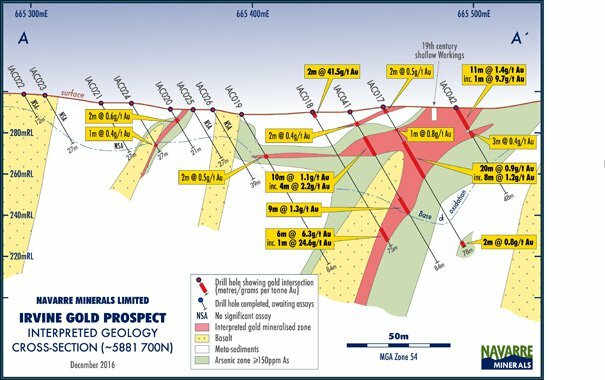 Navarre Minerals (ASX: NML) released some promising drilling results from its Stawell Corridor Gold Project on Thursday which featured solid grades and impressive widths. These included 7 metres grading 2.7 grams per tonne gold from relatively near surface, part of a 36 metre zone grading 1 gram per tonne gold from 2 metres downhole. There were also two other separate intersections of 14 metres and 11 metres with grades of 1.4 grams per tonne gold. On a better day for the commodity it could be argued that NML’s shares would have responded positively to the news, but with sentiment towards gold stocks down this week as the commodity pulled back from circa US$1180 per ounce a week ago to approximately US$1130 per ounce today it has been tough going for the sector. As such investors should understand that commodity prices do fluctuate and caution should be applied to any investment decision, particularly in early stage companies such as NML, and not be based on spot prices alone. Seek professional financial advice before choosing to invest. Yesterday’s plunge in the S&P/ASX All Ordinaries Gold index (XGD) was one of the largest one-day falls in the last 12 months as it spiralled from the previous day’s close of 3815 points to close at 3625 points, representing a slide of 190 points or 5%. However, one needs to take into account the fact that the Australian dollar has come off significantly against the US dollar over the same period, helping to offset the decline in the Australian dollar gold price, a significant factor for Australian producers. Taking into account currency fluctuations, the fall in the Australian dollar gold price over the last week has only been about $30 per ounce or 1%. Working on a gold price of US$1130 and an exchange rate of US$0.735, the Australian dollar gold price is approximately $1540 per ounce, leaving healthy margins for most Australian producers. 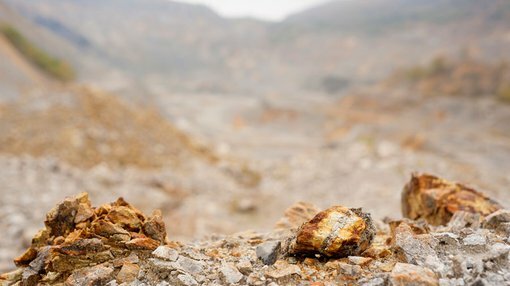 The presence of near surface gold mineralisation as was encountered in the course of drilling often translates to relatively low mining costs, suggesting that a potential project could yield economically attractive margins. 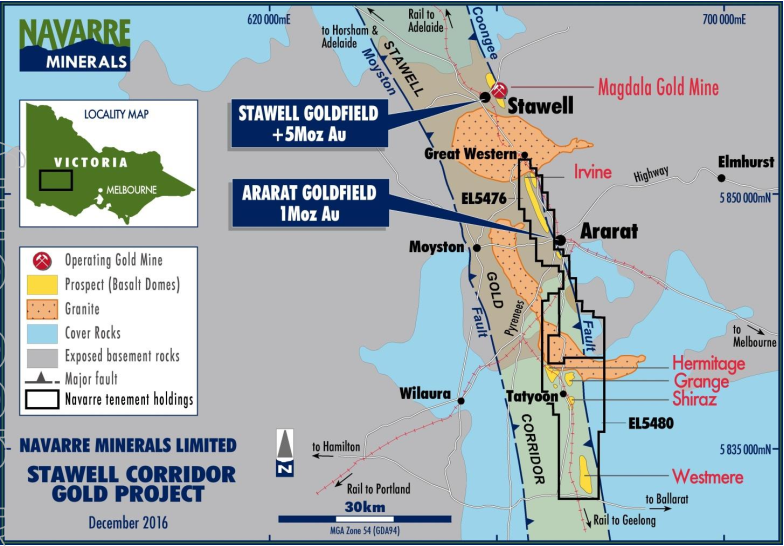 Management highlighted that the initial results of drill testing of Target 3 of the Company’s Irvine gold prospect (part of the broader Stawell corridor project as shown below) demonstrated several continuous broad zones of oxide gold mineralisation coinciding with a large quartz stockwork zone typical of those occurring at the nearby Stawell Magdala Gold Mine. This new oxide mineralisation zone presently extends from surface to about 40 metres depth and is believed to be continuous over a strike length of more than 500 metres, remaining open to the north and also at depth into the fresh rock (see diagram below). When intersected in fresh rock, the gold mineralisation occurs more like a ‘classic Magdala basalt contact position’ where the mineralisation boundaries become more discrete and the grade much higher. The highlight result to date is 6 metres grading 6.3 grams per tonne gold from 66 metres down hole (including 1 metre at 24.6 grams per tonne) (see Cross-Section above). Results for the remaining 15 holes testing the northern continuation of Target 3 and for an additional 27 holes testing similar type targets are expected to be released in coming weeks. These results could be a catalyst for further positive momentum for NML. In summing up the drilling results management said, “Target 3 is believed to represent ‘classic’ Stawell-style gold mineralisation where quartz stockwork veining is developed over a basalt flow termination or ‘nose’, transitioning to typical basalt-contact style gold mineralisation at depth”. NML noted that similar extensive shallow oxide gold mineralisation occurs at Stawell’s Big Hill project (138,000 ounces grading 1.36 grams per tonne gold) that overlies a +4 million ounce underground orebody.